Announcing the UC Now apps! I’ll be tracking my notes with installing and working with Skype for Business. Fabric version is unknown. No it’s not. It’s what came on the install image! It’s version 3. Good ol’ Windows Fabric strikes again. I’ve tried rebooting and forcing the reset a few times. Finally I uninstalled Windows Fabric and installed it again from the Skyp4B .iso. Same problem. So this pool is hosed and since this is a lab I don’t want to spend any more time figuring this out. Update: As I removed roles from Topology for this pool, like conferencing and enterprise voice, I tried to start the service again. It finally started. 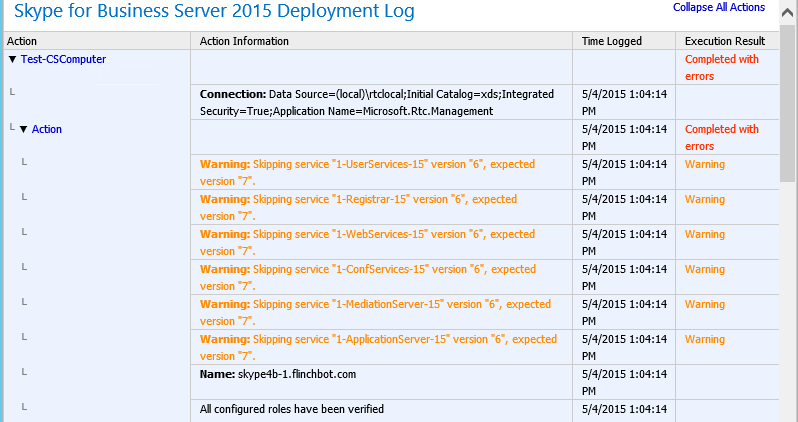 It is possible that re-running the deployment wizard straightened a few things out. I’m wondering if running Enable-CsComputer separately would have fixed it too. My takeaway: Don’t do in-place upgrades of production machines. Now this error may not be related to the in-place upgrade process. However, doing a fresh install assures that you can test the pool before moving users. It also gives you the chance to do things like installing the latest OS, building it on newer hardware, installing the latest Windows patches if you’ve fallen behind, etc. 2. Control Panel still can’t sort. This is about unacceptable. Seriously Microsoft? You can get media to traverse NAT’s, firewalls, edge servers, etc but you can’t sort a list? You’d think by the 3rd release of the Lync line of software that they could get some intern to show them what he learned in his first programming class ever: How to sort a list. At work we have admins scattered all over the place, a few dozens pools, and more supported SIP domains than I want to count.. Trying to find the right entry in some of our lists is very difficult and frankly a waste of my time. Sorting is hard. It’s like math but hardererer. So if you get this error, remove the Skype servers you put into the Lync 2013 folder and add them again to the Skype for Business folder. Removing them from Topology might give you an error that a conference directory already exists on the pool you are trying to delete. Delete that by running the Remove-CsConferenceDirectory with the -force switch and then try the Topology removal again. 4. Not everything is a straight port from Lync 2013 with the “Skype Look”. The certificate wizard was actually simplified and I like it better. They also updated the “Start Services” text to explain that you really shouldn’t start the services until your pool is ready. It’s a minor fix but I bet it will reduce some of their support calls. 5. There is no way to in-place upgrade an SBS/SBA. While this would have been *really* useful and possibly the only use of in-place upgrades I would have used in production, Microsoft doesn’t support this. My guess is that this is because Microsoft foolishly still makes the SBA vendors provide custom (and wholly redundant) “Install code” which could fail to function in an upgrade scenario. This is yet another reason why the SBA/SBS model is excellent on the drawing board but is full of issues and miss-steps in production. So much like the upgrades from 2010 to 2013, you have to do full re-installs to get to up to Skype4B. The SBA code hasn’t been released yet because of the reliance on 3rd party vendors to provide their no-value-add install wizards. 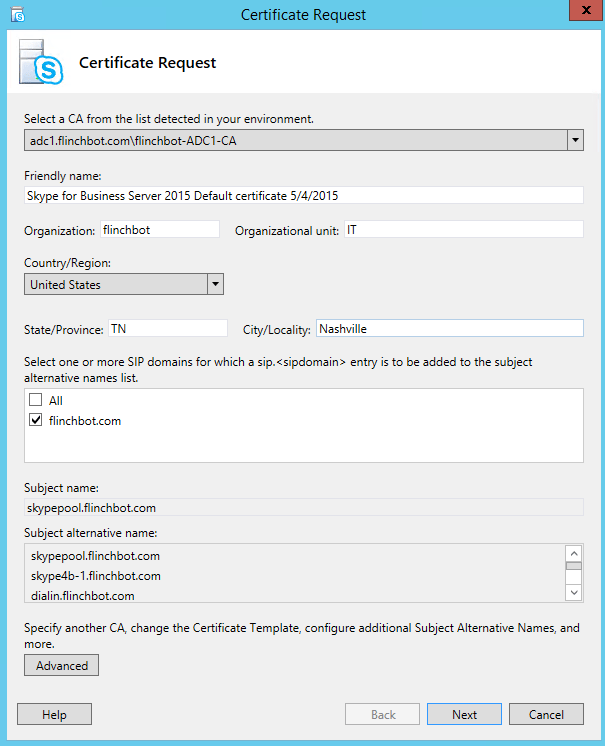 An SBS does not rely on this pointless vendor integration so you can upgrade those on your own – full uninstall of Lync followed by the Skype4B install off the .iso. 6. That annoying 29820006 patch. You can’t install it. Oh you keep trying. Then you realize it’s the x86 patch. So you download the x64 patch and it still won’t install. So I’m not sure exactly what the magic is, just make sure everything in Windows Update that is mandatory or recommended is installed. I think there is an update to Windows Update that has to be installed before you can install this patch. I am having a hell of a time with the Edge server. At first I followed the same instructions and killed the services, then it couldn’t find the updated topology so I managed to get the agent to replicate the topology but it fails again when it tries to remove services…argh. I haven’t tried my edge server yet because….I never got it working with 2013! Maybe upgrading it to Skype4b will magically fix it.